TreeThinkers is a blog devoted to phylogenetic and phylogeny-based inference. We aim to use it as a place to discuss recent research and methods; to ask and answer questions; and serve as a general resource for news and trivia in phylogenetics. We have already had several posts since the 2013 Bodega Workshop ended and we plan to keep things going strong. This post is meant to give a (belated) introduction to the blog and provide some general information about how things work around here. The group of us that organize the Bodega workshop have been talking about developing a blog associated with the course for a few years. Following the switch from our increasingly clunky wiki to this shiny new site, we’ve decided that the time was ripe….and here we are! Several of us Bodega instructors have signed on as contributors, and we welcome guest posts or regular contributions from the rest of the community. Get in touch with me if you’re interested. As a blog associated with a course, one of our central focuses will always be on teaching. Brian Moore has a running series of posts called MCMC Corner that discusses various aspects of Bayesian inference. Looking at his drafts of upcoming posts, this looks to be an informative and useful set of articles. We will also be posting on general topics of interest, best practices or common sources of confusion encountered in phylogenetic analysis. Rich Glor’s tutorial explaining the various parameterizations of the Gamma distribution is a great example. Finally, we’ll post about recent findings, news, and announcements that are relevant to phylogenetics. One of our major goals here is to lower the learning curve associated with phylogenetic inference. With that goal in mind, if you have a question, ask it! Leave a comment, tweet @treethinkers, email me, or email one of the contributors and we’ll do our best to answer it in a post or a tutorial. 1. Please consider posting under your real name. This helps build the community aspect of the blog. 2. Be respectful. Criticism is fine, but please keep it tactful and constructive. We use an automated spam filter to help deal with comments. If your comment doesn’t appear within a few hours, send me an email. It’s likely that the spam filter erroneously caught it. We welcome guest posts on any topic related to phylogenetics. If you’re interested in contributing or just want to float an idea, get in touch and I’ll get you set up. In particular, we urge former Bodega Workshop students to get involved. Let us know what you’ve been up to! Images: Please try to include an image with your post. Images should be narrower than 650px wide as this is the standard width of the content area. Larger images slow down page load times and can introduce formatting problems (particularly when the page is viewed on a mobile browser). Breaking up long posts: Please use the ‘Continue reading’ feature to break up posts longer than about 2 paragraphs. To insert the break, place a <!- -more- -> tag at the point in your post where you want the break to occur. Twitter integration: Our twitter account is configured to tweet the title of new posts. You can edit the default message or turn this feature on or off in the ‘Publicize’ panel immediately above the ‘Publish’ button. Categories: By default, all posts are placed in the ‘Uncategorized’ category. Use the check boxes on the post formatting page to update this to something more useful. support. You can use it by placing your code inside the following tag structure: $latex your-code-here$. Tack an ‘&s=X’ onto the end (where X equals some number -4 to 4) to fiddle with the size. We have support for most common languages, just swap out ‘r’ for whatever language you’re using. 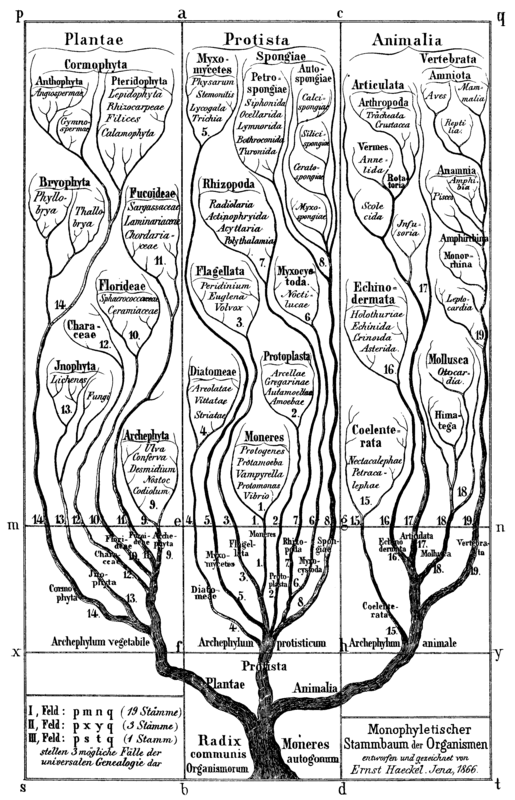 The tree in our logo is a stylized version of Haeckel’s famous Monophyletischer Stammbaum der Organismen (monophyletic genealogical tree of all organisms). Haeckel is credited with making this first attempt at illustrating the “tree of life” of all organisms, as well as inventing the term ‘phylogeny’. This entry was posted in News on 28 March 2013 by Bob Thomson. Nicely done Bob, I dig the new logo! I’ve got a bunch more posts and pages in progress that should help keep the ball rolling. A new tutorial on the use of SIMMAP 1.5 for stochastic character mapping is on the immediate horizon (the gamma tutorial was a step in the direction of completing the SIMMAP tutorial). Rich: looking forward to that SIMMAP tutorial.